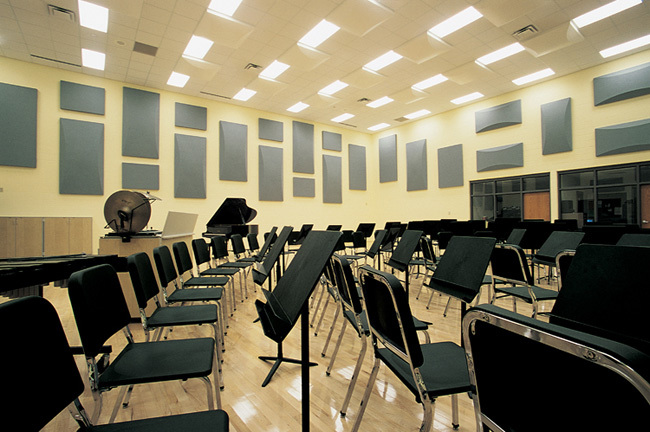 Whether you’re building a brand-new rehearsal room or need to enhance your existing space, Wenger can provide the consultation and acoustical panels to help you succeed. We design and manufacture our own highly advanced acoustical products and Wenger knows how to apply them to optimize the acoustics in your room. Guaranteed Acoustical Performance – Every room is first analyzed to provide the best solution of absorption and diffusion – and then Wenger guarantees the resulting acoustical performance! Solves Acoustic Problems – Wenger understands the acoustic problems that negatively affect rehearsal rooms such as flutter echo, hot spots and dead spots, clarity, and excessive loudness. Wenger has a diverse product offering to effectively eliminate these problems. Aurilization Capability – Wenger can provide a simulation of the reverberation of a rehearsal room in order to “hear” the recommended acoustical effect before you purchase. 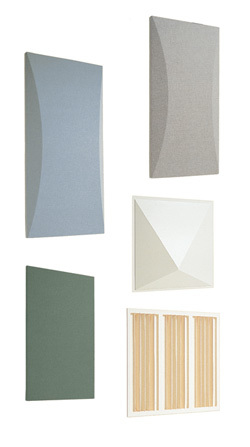 Wenger has engineered five unique technical designs, in dozens of sizes, shapes, and diffusion angles and finish options, to yield a broad selection of acoustical panels. Suited for a wide range of music environments. Designed to neutralize the reverberation and loudness of a room. Engineered to absorb sound across a broad frequency range for effective, balanced abatement. Designed to scatter and blend sound, these panels diffuse middle- to high-range frequencies that define timbre and articulation. Significantly larger than Type I panels, but with the same shape. In addition to sound-diffusion qualities, they selectively absorb low-frequency sound. Engineered to provide the most effective diffusion in the 750 Hz to 3300 Hz range. These 4' x 4' (1219 mm x 1219 mm) diffusers are designed as easy-to-apply ceiling in-lays. Impact-resistant ceiling and wall diffuser panels feature an offset pyramid shape to treat specific acoustical applications. Ceiling mounts in 4' x 4' (1219 mm x 1219 mm) and 2' x 2' (610 mm x 610 mm) sizes. Wall-mount in 4' x 4' (1219 mm x 1219 mm) only. Wenger acoustical panels add visual appeal. You can choose from more than 48 attractive fabric colors to coordinate with other Wenger products, and complement your color scheme.